Simon tells Ryan to come out of the closet. Ryan’s tan goes from brown to red. Paula Abdul cries when “Doolittle” sings and then appears to be crying at her very own words. 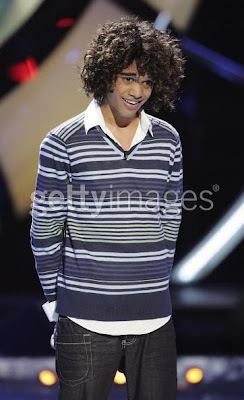 Sanjaya literally got a home perm. No joke. It was the kind of home perm that my mom gave to my sister when she was like 10 years old. For me it was a toss up between Shirley Temple and Rhea Perlman. 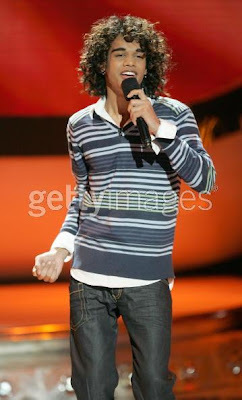 While Sanjaya was not really ready for his song, he is ready for the prom with a hairstyle like that. Good for him. Good for Ogilvy. Diana Ross continually tells the rocker chick to “pronounciate” her words. Seriously, she told her like 7 times to “pronounciate” her words. Isn’t it “annunciate?” When my spell check didn’t pick it up I figured she was wrong. F7 rules. When you forget the lyrics and all else fails just throw up your hands like it was intentional. It worked for Haley. Paula insults the audience by claiming that “half the time you mess up the lyrics the audience doesn’t know…the audience doesn’t know anything.” Hmm. Paula, are you the audience then? The bald dude comes out to sing. I fall asleep. When I awake, I wonder why Bull from Night Court is performing. I fall back asleep and dream of Markie Post. During the final moments of the show I wonder why/how I watched 2-hours of this. I then wonder how about 9 of these people ever made it to Hollywood. I then feel sad for myself. American Idol: Country Music. Ouch.